This past weekend was loaded with some new recipe creations, including that of the Thai three sauce, and an array of other items. As I was planning out dinner for the family, I decided to make some of their favorite Vietnamese style chicken, along with sticky rice. My kids love sticky rice, and so do I for that matter, and while I was soaking the rice, a thought came into my head. Go figure. 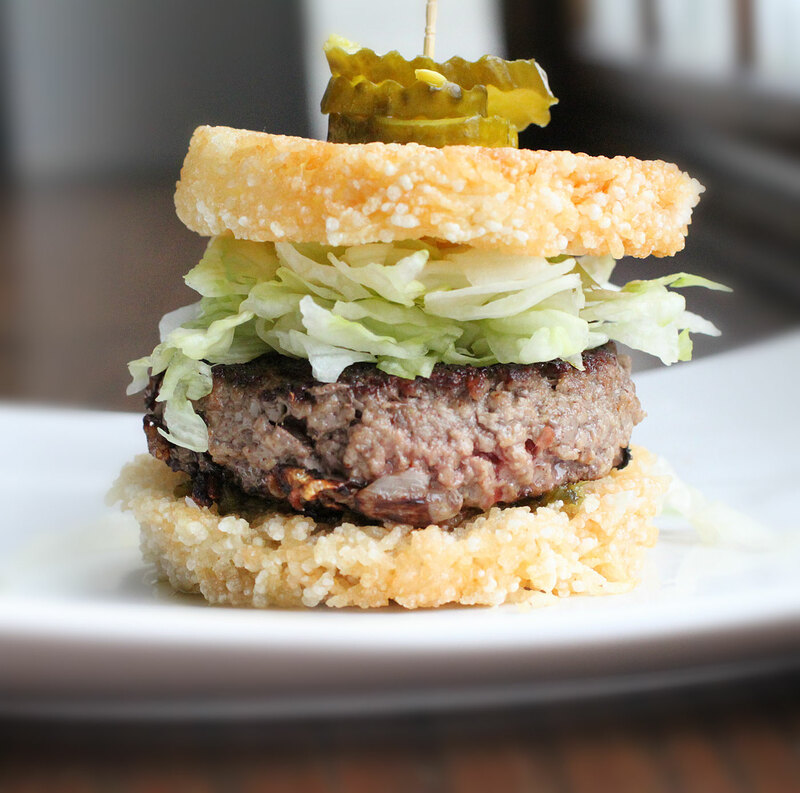 I thought, why not take the rice, form them into buns, lightly fry them and well, make a cheeseburger. Crazy, I know, but interesting, and pretty darn delicious. I probably got the idea from old posts regarding a ramen style burger, and most likely because I was making stock the night before for ramen. Start by straining your rice, until the water runs clear. I use a particular rice steamer, but you could probably follow these directions as well. I add water to my steamer, bring to a boil, and soak a wicker steaming basket, then insert into the steamer, being careful the bottom of the basket does not touch the top of the water. Add the rice, cover, and cook for about 15 minutes, then remove the basket, bang the basket on the side of your stove or counter, and use your motion, much like you would flip an egg in a skillet, and flip the rice to the other side. Return to the steamer, cover, and cook another 10 minutes. Once cooked, dump out onto a large board, and use a spatula to break up the rice, then fan it to prevent it from further cooking. Add to a bowl, and cover with a towel. Next, heat a skillet with the oil and bring it up to temperature. Take some of the rice, and form into bun shaped patties. You want about a half inch thick. I use ring molds form precision in both the rice patty, as well as the burger. 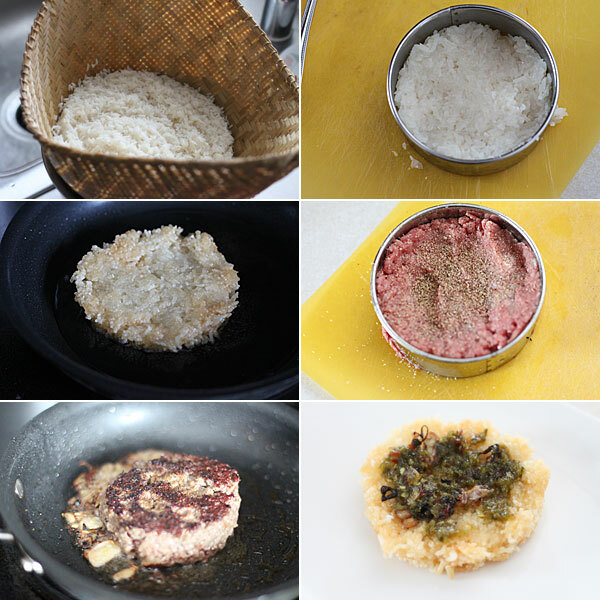 Once you have formed the two rice patties, add one to the oil, and cook on both sides until a light golden brown occurs. Remove and place on a paper-lined plate to drain any excess oil. Repeat with the remaining rice patty. During this time, form your burger patty, and season both sides with salt and pepper. Drain the oil, and return back onto the stove on medium heat. Toss in the shallots, and push them to the edge, continuing to cook while you add the burger patty. Sear the burger, and cook to your liking. I go medium with mine. Next, bring it all together. Take one of the rice patties, and slather it with the Thai sauce. If you do not have Thai three sauce (highly recommend it), then use an Asian chili sauce. Top with the shallots, and burger. Pile on the lettuce, then the remaining rice patty. Spear a few pickles on top, and dig in. If I divorce my husband would you marry me and cook for me every night? We went on hoiliday to Northern Thailand (Chiang Mai) and fell in love with the place. I have been looking for ways to recreate some of the memories from that fabulous trip. This is excellent.. and as i’m not a very good cook , looks as if its going to be within my skill bracket!! Thumbs up to this burger! Looks killer-good!